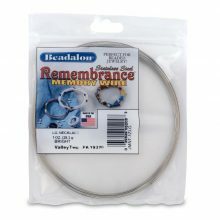 Remembrance is a thin (0.62mm/.025″) stainless steel wire used as a beading medium. The wire is corrosion resistant and will resist tarnishing. 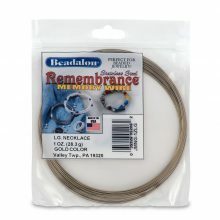 Like a spring, Remembrance wire is rigid and snaps back to its original form when expanded and released. The wire “remembers” its shape and retains its coil form. 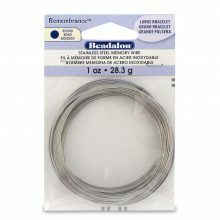 To make a design: make a loop at one end of the wire with Round Nose pliers or with Memory Wire Shears. Slide beads on until the wire is full, then terminate by making another loop. 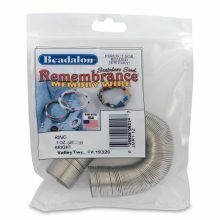 As an alternative to looping the ends, you can glue End Caps to the beginning and end of wire to obtain a more finished look. 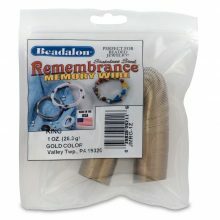 Jewelry Wires memory necklace silver/br lrg.